posterior to the glandular parenchyma is well appreciated. c This oblique view shows a stellate figure (arrow) in the axillary tail of the breast. d The structure is invisible on the craniocaudal view. It was due to a superimposition of multiple different normal structures. cancer will not spread and may in fact become more conspicuous as the superimposed tissue is moved out of the way. Is there a soft tissue mass in the center of the star? Are there any calcifications visible inside? 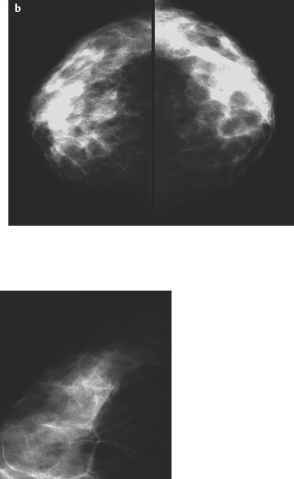 If there is a circumscribed soft tissue mass in the breast, examine its contour with care. Does it have sharp borders all the way around? Do you perhaps see a halo—a narrow rim of decreased density—around the mass? Or do fingerlike extensions of the mass seem to infiltrate the neigh boring tissue? 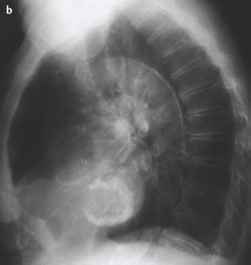 Are there any calcifications associated with the mass? Finally, the mammograms are searched with a magnifying glass and the skin contour is assessed with a hot light. Again, are there calcifications detectable? If yes, are they large and coarse or fine, linear, or branching? Do they follow the normal course of vessels or do they align themselves to the glandular duct system? Magnification views facilitate the analysis of suspicious calcifications. In a symptomatic patient, a palpable lesion or a positive mammographic finding will be further assessed by an ultrasound examination for further characterization.